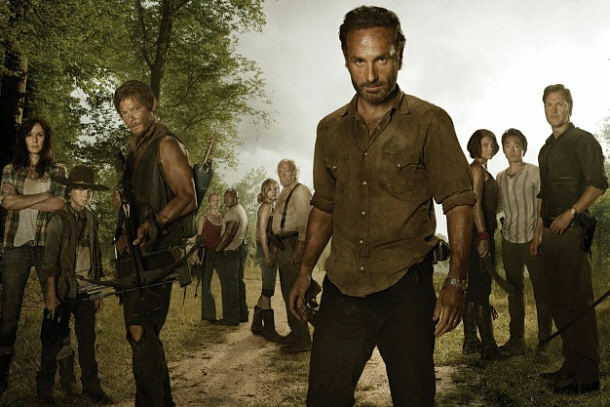 After seven long months, “The Walking Dead” is finally back. Season three picks up several months after last year’s finale. Gone is the safety of Hershel’s farm and to some degree, gone is the fear. No one in the group is scared anymore but each of them knows that they are not safe. The opening of the episode is one of the best sequences in the entire series. Rick and the rest of the group raid an abandoned house while taking down any walker left inside. They all work as one cohesive unit and not one word is spoken during the entire sequence. The time jump between seasons is a huge benefit as each character has evolved and adapted to a world infested with the undead. Carl is now more a part of the group; he’s their “child soldier.” Lori appears ready to give birth to her and Rick’s child (Or is it Shane’s?) any day now and the tension between the two has only become more pronounced with the passage of time, the two barely make eye contact throughout the episode. The “Ricktatorship” established in last season’s finale has carried over as Rick is the unquestioned leader of the group with Daryl as his number two. 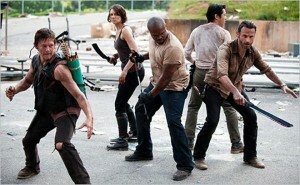 T-Dog has some pretty cool moments for once and Maggie has become pretty adept at hand to hand zombie take down skills. 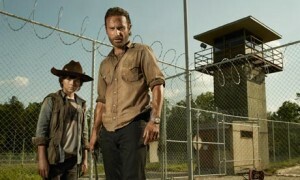 This season of “The Walking Dead” is the one that fans have been waiting for. The iconic prison from the comic book source material is introduced as well as the katana wielding Michonne. Although she is not given much screen time, it’s more than enough to satisfy fans of the comic book like myself. One minute she is beheading walkers the next she is tending to Andrea. More of these two would have been nice but the break neck pace of the episode it’s clear why they had to be cut out a bit. Episode director Ernest Dickerson has to be given a ton of credit for how well the premiere was executed. The scene when Rick and the gang take the prison is breathtaking. We see how different each character has become since season one as they now seem to take joy in killing a walker. The scene in the prison yard when Maggie and Beth begin to sing a campfire song could have come off as cheesy but with walkers clawing at the gates behind them in the background of the scene it was more chilling then anything. Another standout scene has to be Lori fearing the worst about her unborn child. There is something about a baby walker that freaks me out more than any living one that we’ve seen on the show thus far. I’m not sure whose idea it was to put zombies in riot gear but, hats off to whoever that person is because that was a chilling sight. When Maggie figures out a way to penetrate the brain through their riot helmet and says “did you see that?” I couldn’t help but smile. There are currently 3 Comments on The Walking Dead S3 Seed Review. Perhaps you would like to add one of your own?